The Camino Salvado is about reflection, connection and renewal. It is not always an easy path to follow but should you choose to follow the Camino, you will not be disappointed. It is a Camino for all peoples – those of faith, those with no faith and those who seek faith. St Joseph’s invites you to join one of its two organised and ecumenical Camino Salvado groups (including accommodation, meals and return transport) on August 25th-September 1st 2019 and September 8th-15th 2019 here. 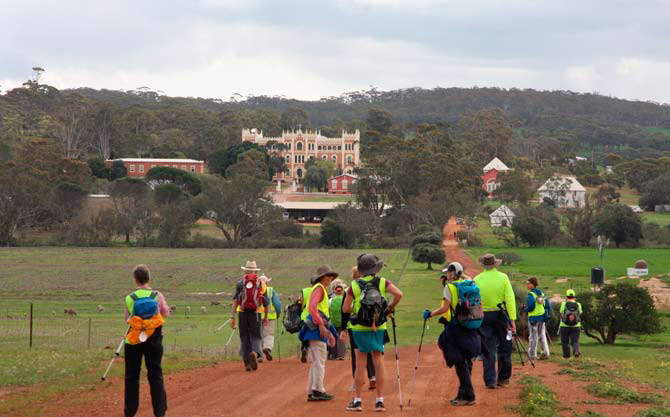 Other independent individuals and groups, schools, walking clubs, etc should contact the Pilgrim Trail Foundation. here. Please Note: The St Joseph’s Camino Salvado maps on the following pages differ in some details from those of the Pilgrim Trail Foundation. For the Pilgrim Trail Foundation maps, please click here.